Bexhill Road is somewhat quieter, now that Coombe Valley Way is open. So let’s build a Sports Complex and as many houses as we can possibly fit in. Now I am not averse to sports facilities here, but the baggage that accompanies this scheme is worrying for all in the Bexhill Road and Bulverhythe area. If the plans are adopted, traffic will increase, this is beyond doubt. Building on Landfill is risky, what will you find when sinking piles for a stadium complex. Bulverhythe Rec itself, (the first tier) the part of the plan that concerns local people the most. Build 160 houses on a flood plain, good plan. When questioned, developers’ representative couldn’t adequately explain how the ever present water would be dealt with. A two-metre diameter pipe was mentioned, to be placed in the ditch at the bottom of our gardens. All excess water would gravitate to a point somewhere beyond Freshfields, where a deep hole would be dug together with other new lakes in Coombe Haven Valley. I am no expert but 50 years in this area tells me that any pits excavated in a flood plain would be inundated as the water table finds its own level. The next part of the plan, to get rid this water, is to pump it from Freshfields to the Haven River, when the river can take it. The Haven in recent years has looked untended and overgrown, its tidal sluice system fragile at times. I imagine some realisation is setting in, increase in estimates and cuts to profits may have put off the first housing developer – however, they will not be the last. 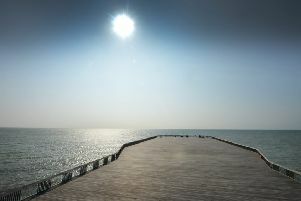 We should thank the sheik for buying Hastings pier, at least that’s free! This crazy housing scheme must be opposed. This much loved green space, part of the Coombe Valley Country Park, opened by the Prince of Wales in 1927, must be kept for generations to come.